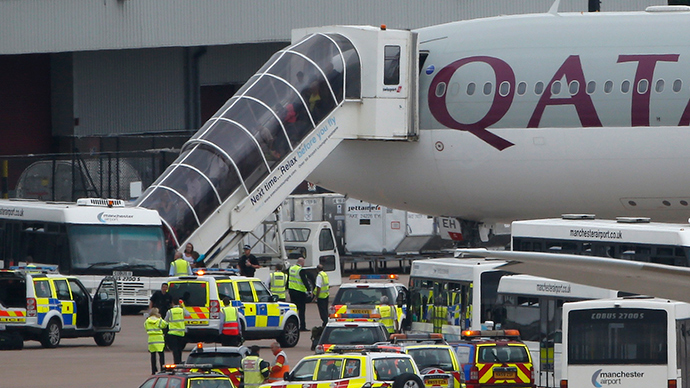 British police have arrested a man on suspicion of making a hoax bomb threat onboard a Qatar Airways flight from Doha, according to media reports. The passenger allegedly passed a note onto a member of the plane's cabin crew claiming there was a bomb on board. He has since been held in custody, according to the Manchester Evening News. The plane, which has been identified as a Qatar Airlines flight QR23, was escorted into Manchester airport by an RAF 'Typhoon' fighter jet from RAF Coningsby in Lincolnshire, following warnings of a suspicious device on board. The plane landed in Manchester airport at 13.15 GMT, and was surrounded by armed police and firefighters immediately after. The passenger was escorted off a Qatar Airlines passenger plane by armed police, according to an eyewitness report. In a press statement, officials at Qatar Airways said that one of its crew members received a threat about a possible device onboard the aircraft, and that “Qatar Airways immediately took all the necessary precautions to alert British authorities”. "The crew is now fully assisting police at the airport with their inquiries. The safety and well-being of our passengers and crew is our top priority. As this is a matter of a police investigation, we cannot comment further at this time" a spokesperson said. They also confirmed that there were 269 passengers and 13 crew members on board the plane. According to websites that track flight data, the plane circled the peak district twice before it approached Manchester with the assistance of the fighter jet. Recalling the events on the plane to BBC news, passenger Matthew Cox said that he had 'no idea' the plane was being followed by the RAF Typhoon, and that he found out about the bomb threat on Twitter. "At least it’s all a hoax, it could have been a lot worse. I’m a bit worried, nervous about the whole thing. I don’t feel too worried now I’m off the plane, it’s calmed me down I suppose" he said. Talking about the arrest of the passenger, Cox said "he (the passenger) seemed no different to others on the plane, nothing unusual". "Armed police came on and found a guy, searched him and made him stand up with his hands on his head and took him off the plane" he added. Manchester Airport said that runway operations at the airport were suspended for 25 minutes while authorities dealt with the incident. The airport has confirmed that its operations have returned “back to normal”.